During the past 30 years, significant changes have occurred in household energy use in the U.S. According to the Residential Energy Consumption Survey (RECS), compiled by the Department of Energy, fuel oil (also called heating oil) usage as a heating fuel has declined while electricity usage has increased. Since 1979, the percentage of households using fuel oil or kerosene as their main heating fuel has dropped from 22 percent to almost 6 percent in 2009. Over the same period, the percentage using electricity as their main heating fuel increased from 16 percent in 1979 to 43 percent in 2009. Use of propane as the main heating fuel has decreased slightly, from 5 percent in 1979 to 4.8 percent in 2009. Natural gas remained the dominant main heating fuel, and its usage held steady for a number of years, at 55 percent from 1979 to 2001; however, it fell to 46 percent for 2009. Among low-income households the type of heating energy used has mirrored the national trend, except that the increase in electricity usage was more dramatic. Since 1979, the percentage of low-income households using electricity as their main heating fuel tripled from 10.4 percent to over 45 percent in 2009. Among LIHEAP recipient households, use of electricity as the main heating fuel was 19 percent in 2005. Low-income households that use fuel oil as their main heating fuel declined from 20 percent in 1979 to 8 percent in 2005. Among LIHEAP recipient households, 12 percent used fuel oil as their main heating fuel in 2005. Use of propane as the main heating fuel by low-income households stood at 5.2 percent in 1979, while in 2005 it was at 6.2 percent. For LIHEAP recipient households it was 5.2 percent in 2005. Households that heat with fuel oil and propane have historically had higher bills than those using other heating sources. This continues to be true among low-income and LIHEAP recipient households. According to the 2011 LIHEAP Home Energy Notebook, the average annual heating bill for all LIHEAP recipients, across all fuel types, was $2,106 in 2011. The average annual fuel oil bill for these households was $4,350. The 2011 average heating bills of LIHEAP household for other fuel types were: natural gas, $1,786; electricity, $1,364; and propane, $3,591. The Notebook based its data on the 2005 RECS and 2011 heating degree days, cooling degree days, and fuel prices. According to the 2012 American Community Survey, the oldest homes in the U.S. are found in the northeast. Fuel oil bills are higher because the majority of households that heat with oil are in the Northeast and they tend to reside in older homes with less efficient furnaces that use more fuel. In contrast, homes heated by electricity tend to be smaller and newer, have relatively efficient heating equipment, are better insulated, and are mostly located in the South and the West. The winters of 2004-05 through 2007-08 saw steady increases in heating oil costs, along with other energy sources. During that period, winter heating costs for all fuels rose an average of 24 percent, while heating oil costs rose 38 percent and propane costs rose 49 percent. During the winter of 2008-09, in the wake of a worldwide recession, heating oil prices plunged 17 percent and propane 2.3 percent — this after heating oil prices had soared to over $4.50 per gallon during the summer of 2008. Heating oil prices spiked again in 2011 to over $4.00 per gallon and stayed relatively high until declining in 2014 to just under $3.00. For the winter of 2015-16, the U.S. Energy Information Administration (EAI) predicts heating oil costs will remain relatively low and stable, about $2.80 per gallon. Across the nation, propane prices spiked to an average of $4.00 per gallon in January of 2014. The Midwest saw prices peaking at $6.00 per gallon. The increased cost of propane was attributed to: a lower stockpile going into the heating season; higher usage because of extended cold weather; a late corn harvest by Midwestern farmers that use propane to dry their corn; and a key pipeline shut down for maintenance and repair. According to the EIA, the average price of propane in 2011 had never been higher. Average prices for propane were below $2.50 during December 2014 and the 2015 winter. While lower home heating prices are a blessing to low-income families, price volatility makes it difficult for families and program managers to manage their budgets. The 2011 Home Energy Notebook also details the residential energy and home heating burden of low-income households versus non low-income households. Energy burden is calculated by dividing energy expenditures by income to express expenditures as a percentage of income, thus providing a measure of energy costs as well as affordability. The Notebook details both the residential energy burden calculation, which is a household's total residential energy expenses, and the home heating calculation, which is only heating expenses. In 2011, 18 percent of low-income households spent more than 10 percent of their income on home heating. On average, LHEAP households spent more than four times as much of their incomes on heating as non low-income households, according to the Notebook. Low-income and LIHEAP recipient households using fuel oil had the highest home energy burden in 2011, spending 25.9 and 28.7 percent of their incomes respectively on this heat source, compared to 6.4 percent spent by non low-income users of fuel oil. Low-income users of propane spent 18.9 percent of their incomes on heat, compared to 18.7 percent by LIHEAP recipient households and 5.4 percent by non low-income households. Low-income natural gas users had a 11 percent energy burden while that of electric users as13.3 percent. By contrast, LIHEAP recipient households using natural gas had a 13.2 percent home energy burden; electric heat users, 14.9 percent. Non low-income households using natural gas had an energy burden of 3.1 percent, while electricity users had 3.3 percent. Of the 6.9 million U.S. households that used fuel oil as their main heating source in 2009, over 1.3 million were below the federal poverty line for a family size of 4, according to the 2009 RECS. The majority of heating oil users, about 5.7 million or 80 percent, resided in the northeast states. Of the 5.6 million households that used propane, over 1.1 million of these users were below the federal poverty line for a family size of 4. The majority of propane users (70 percent) were in the midwestern and southern states. The area likely to be hardest hit by oil price increases or volatility is the Northeast. As a result, for a number of years, LIHEAP directors in Northeast states, as well as a few others across the country, have negotiated with fuel oil, propane and other bulk fuel vendors for discounted prices, credits or donations for LIHEAP recipients. The states have been prompted by volatile fuel oil prices, declining or unpredictable federal funds for their programs, and the leveraging incentive provision of the LIHEAP regulations. Under the leveraging incentive provision, states that supplement their LIHEAP grant with additional non-federal funds or resources — such as discounted fuel prices — that directly benefit LIHEAP households can win leveraging award dollars. For FY 1991, the first year of the leveraging incentive program, seven states leveraged nearly $2 million dollars in bulk fuel discounts, credits or donations. By the end of FY 2010, 9 states were reporting bulk fuel leveraging, and the amount leveraged was $11.4 million. The 9 states that reported leveraged resources from bulk fuel vendors were: Connecticut, Maine, Maryland, Massachusetts, Minnesota, Montana, New Hampshire, South Dakota and Vermont. The largest leveraging program has been Massachusetts' statewide margin-over-rack oil discount program, which saw a high of $8.3 million in savings in 2007. In 2010, the amount dropped to about $3.7 million. Connecticut experienced savings of over $4 million in 2010 while Maine reported over $1 million. The first section of this paper will describe state negotiations with fuel vendors for discounts, credits or donations on behalf of LIHEAP clients; the second will cover other bulk fuel programs that assist low-income households. Background on the leveraging incentive program is available in a LIHEAP Clearinghouse memorandum titled Leveraging Nonfederal Funds for LIHEAP. Following is a summary of the types of bulk fuel discount programs operated by state LIHEAP agencies. Massachusetts has had a long history of negotiations with oil vendors. Reacting to a 33 percent decrease in federal LIHEAP funds between 1985-89, the state instigated a pilot project for LIHEAP clients in the Haverhill area of northeastern Massachusetts for FY 1989. Companies bid for an acceptable profit margin above their "rack" or wholesale oil price and a contract was given to the company with the best bid. Although the program was controversial with the oil industry, LIHEAP officials estimated that in 1989 it saved $85,516 or approximately 17 cents per gallon for LIHEAP clients. It was reinstated in 1990, when it saved $91,244 or approximately 20 cents per gallon. Now in its 26th year, the Haverhill competitive bid program is a permanent program in 11 cities and towns. In 2015, LIHEAP clients saved 15½ cents per gallon of fuel oil. Despite the savings, state officials say it would be difficult to duplicate the competitive bid program in other parts of the state. Since the winter of 1991, Massachusetts has had a statewide "Margin Over Rack" (MOR) program that pays oil dealers the lesser of either a set margin per gallon or their regular retail price on the date of oil delivery. From 1991 through 2000, the margin was 25 cents per gallon; in 2000 the state raised it to 28.5 cents per gallon. 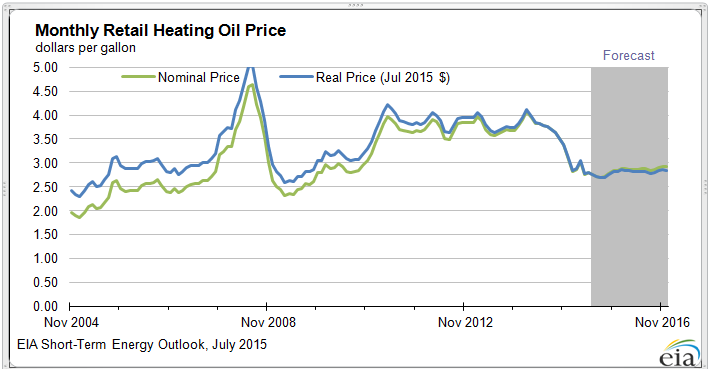 For 2008-09 and 2009-13 the margin was 40 cents per gallon and for 2015 the margin rose to 50 cents per gallon. Vendors requested the higher margins due to their increased operating costs. Unlike the competitive bid program where only a few dealers could participate, the MOR program allows all oil vendors to participate. Savings, which normally average about 10 cents per gallon during the winter months, have fluctuated over the years from less than $1.5 million in the late 1990's to a record $8.3 million in 2009. For 2014, the state reported over $2.2 million in savings for 53,584 households. The MOR concept is based on the fact that oil vendors base their per gallon retail price on a margin added to their terminal or "rack" price. Each vendor's margin is different due to variances in operating costs associated with delivery of the product. In negotiating for its discount programs, Massachusetts officials pointed out that the average vendor's business from LIHEAP clients is small; approximately 3 percent of the state's residential oil consumption is by LIHEAP clients. Countering oil industry arguments, the state has maintained that while the volume is significant enough to warrant some form of discount for LIHEAP recipients, the discount would not result in significant across-the-board increases for the entire customer base. Massachusetts attributes its success with the MOR to its LIHEAP vendor payment system which guarantees that, if they deliver, the vendors will be paid. Furthermore, its subgrantees have always had good relationships with the vendors and, in promoting the concept, the state involved vendors, trade councils and subgrantees. The state has encountered little problem with oil vendors refusing to participate in the program — 511 participated in 2015 — and this has held true during recent winters when prices have been volatile. The LIHEAP grantee administers the MOR program, tracks wholesale prices and sets daily or weekly MOR prices. The fixed price margin is reviewed each year. Oil vendors are required by contract to submit delivery tickets with their current retail price. This information is entered into each Subgrantee's database. The software programs used by Subgrantee agencies are designed to compare the retail price of oil and the margin-over-rack price for the date of delivery. The lesser of the two is paid to the vendor. Both prices are maintained on the database for reporting purposes. Subgrantee agencies provide the state LIHEAP office with a monthly report detailing the amount of gallons delivered to households, the actual retail price for the oil delivered, the "MOR" price paid for the deliveries and the difference or savings by vendor. Connecticut's statewide fixed margin program started out as a pilot in 1990 in one community action agency; and became statewide two years later after expanding to two other service areas. As with the Massachusetts program, a predetermined amount — 25 cents — was added to the wholesale price of fuel oil at the New Haven Harbor port for resale to LIHEAP recipients; this amount increased to 28 cents effective FY 2005, and to 31 cents for FY 2007 due to concern from oil vendors about increased operating costs. The program pays participating vendors the margin price or their retail price, whichever is lower. Vendors must put their regular retail price on all delivery tickets. The local administering agency or the state calculates the fixed margin price. In March 2008, Connecticut's Governor authorized the LIHEAP office to boost payments to vendors participating in the fixed margin program by 4 cents per gallon through the end of the season. Because of the ups and downs of the oil market that year, dealers had sometimes paid more for the oil than the LIHEAP reimbursement. In 2009, the state included county differentials in the pricing mechanism so that the margins varied from 31 to 38 cents based on each county's proximity to the New Haven harbor. For FY 2008, Connecticut added a discount off retail option for deliveries of fuel and/or kerosene. Vendors making deliveries to LIHEAP households were paid the daily retail price at the time of delivery, less a 35 cents per gallon discount. According to state records, the program saved LIHEAP recipients over $55,000 in its first year, an average of 18.6 cents per gallon. Between 2001 and 2007, the program saved on average 2 million each year. Recent years have seen bigger savings, $5.2 million in 2009 and $4.2 million in 2010. In FY 2015, at a fixed margin of 31 cents per gallon, the program saved over $3.3 million for 31,324 households. The difference between the retail price and the fixed margin price was 27.5 cents per gallon. Connecticut's vendor agreement provides more information. Like Massachusetts, Connecticut estimates that each vendor's LIHEAP clientele is a small part of their total business, about 2.7 percent of the state's total residential fuel oil sales. New York initiated its HEAP Heating Oil Pilot program in 2004, for the purpose of increasing the buying power of LIHEAP funds. At that time, the state estimated that about 40 percent of low-income households used bulk fuels such as heating oil, propane or kerosene, and approximately $60 million of the state's LIHEAP grant, about 30 percent, was spent on these fuels. The HEAP Heating Oil Pilot Program was a partnership between the Office of Temporary and Disability Assistance, the LIHEAP grantee, and the New York State Energy Research and Development Authority (NYSERDA), which administers a statewide public benefits program funded by a system benefits charge (SBC). NYSERDA used a portion of the SBC monies to help develop, implement, monitor and evaluate the heating oil program. During FY 2005, the pilot's second year, 65 percent of the vendors in five upstate counties participated in a margin-over rack program. In FY 2006, the program opened to 20 counties and it began offering a new option for vendors called discount off retail pricing, under which vendors agreed to subtract from their posted price a discount of 13cents per gallon for oil purchased with a customer's LIHEAP benefit or 9 cents per gallon for all deliveries to LIHEAP customers throughout the season. These discounts also applied to kerosene and heating oil/kerosene blends. The pilot program went statewide in FY 2008 and is now called the Oil Buying Component. For FY 2015, the MOR heating oil margin was 35 cents per gallon applied to oil purchased by LIHEAP funds, or 41 cents per gallon for all oil sold to LIHEAP customers throughout the season. For discount off retail, the amounts were 13 cents per gallon for purchases using LIHEAP funds and 7 cents per gallon for all deliveries to LIHEAP customers throughout the season. More information and a current vendor agreement is available on the program's home page. Vermont started a statewide summer fuel purchase program in 2002 with an advance from state funds that was allowed through state legislation. Under the program, participating vendors offered LIHEAP households a capped price based on summer rates, but they also guaranteed a price reduction if prices fell below the price cap. At its height in 2003, the program had participation from over half of the vendors, saved over $500,000 and helped over 8,500 households. But in subsequent years, summer prices didn't go down as expected, and fewer dealers participated each year. The state stopped operating the program in FY 2009 and began looking into other options. In FY 2009, a new program required participating dealers to provide the greater of a 3 percent discount off the retail price, or their current cash discount, for all heating oil, kerosene or propane purchased with LIHEAP funds. For FY 2010, the discount was changed to 5 cents per gallon off the dealer's daily posted retail price or cash discount, whichever is greater. Beginning in FY 2014, Vermont required fuel suppliers that participate in LIHEAP to choose either a Margin Over Rack or Discount Off Retail (DOR) program. The MOR price is calculated by adding a margin of $0.50 to the Vermont Fuel Assistance Rack Price that is determined by the Fuel & Utility Office. At the time of delivery, the supplier applies the lower of the MOR price or the supplier's current daily posted retail price with the regular cash or prompt payment discount. The DOR is a fixed discount of $0.15 per gallon off the supplier's daily posted retail price in addition to the supplier's regular cash or prompt payment discount. The MOR and the DOR apply to both regular and crisis assistance, however, the supplier is not required to apply the regular cash or prompt payment discount to crisis fuel deliveries in addition to the $0.15 DOR. MOR and DOR agreements and terms and conditions are accessible on Vermont's state fuel assistance website. Maryland: Like Massachusetts and Connecticut, Maryland has had a long history with oil vendors. The state began by negotiating a 10-percent oil discount for LIHEAP recipients in the city of Baltimore in 1985-86. Maryland officials estimated that roughly 12,000 clients benefited from the oil discount program in the amount of $425,000. However, an attempt to broaden the discount program statewide failed due to the political power of oil dealers. Maryland's LIHEAP later succeeded in obtaining a smaller discount off the current retail oil price for LIHEAP recipients. For the first year, the discount was 3 cents per gallon, thereafter it has been 3 percent off the lowest retail price for non-LIHEAP customers. The 3 cents per gallon discount was too hard to monitor and assure compliance with, and it did not generate sufficient savings if oil prices were high. The percentage discount results in more savings for the low-income when prices go up, but does not adversely affect the dealer when the price is low. Since the program began, Maryland has added coal, propane, kerosene, and wood vendors to the discount program. The state averaged around $200,000 annually from this discount from 1991 through 1994; for FY 2015 it reported $691,275 in savings for 16,869 households. Maine: The state attempted an oil discount program in 1986 that required dealers to provide a 1-cent per gallon discount to LIHEAP recipients. This proposal encountered resistance from oil dealers and was subsequently abandoned. However, the state had luck in negotiating discounts annually and for a number of years it obtained the cash price rather than the credit price for fuel oil and kerosene for LIHEAP recipients, providing them an average savings of 10 to 25 cents per gallon. The amount Maine has leveraged from this resource varied from a low of $677,000 in FY 1997 to a record of $2.5 million in FY 2000. In FY 2007, following the lead of Massachusetts, Connecticut and New York, the state began a margin-over-rack component to replace the cash price discount system. The MOR paid dealers a set margin over the floating wholesale price of heating fuel taking into account each oil company's operating costs and overhead, cost of delivery and other factors, including a profit margin. The Maine Oil Dealers Association opposed the change, calling the mandatory discounts a financial burden and the equivalent of a tax. State officials maintained that the majority of Maine's LIHEAP funds went to these vendors and the state needed to maximize the purchasing power of these funds. Initially, some dealers left the program; however, there have been enough participating dealers to adequately serve the LIHEAP population. In 2010, over 300 fuel vendors provided the per-gallon cash discount to 47,431 LIHEAP households and saved the state over $1 million. New Hampshire: Following the experience of one community action agency that had obtained a discount for nearly a decade, New Hampshire now has discounts statewide. Each local agency negotiates discounts on fuel oil and other bulk fuels for LIHEAP recipients. In most cases agencies receive the vendor's lower cash price rather than the credit price, resulting in savings of from 2 to 20 cents per gallon. In 2010, the state saved over $1 million by providing discounted fuel oil to 20,564 LIHEAP households. Some LIHEAP directors have taken advantage of decreases in fuel oil and propane prices by purchasing these fuels when prices are lowest, usually in the summer, and by attempting to guarantee or lock in lower prices for these fuels for low-income households. However, in recent years that has been more difficult. During the fall of 2004, several LIHEAP directors reported that fuel prices had stayed high during the summer and, as a result, they were less able to obtain better fuel prices from dealers. This trend has largely continued. South Dakota has had a summer fill program for bulk fuels since FY 1994. Suppliers agree to deliver the fuel in the summer and to delay billing until after October 1. These agreements have continued for fuel oil users. Savings from South Dakota's FY 1995-96 summer fill program amounted to $242,920. Because fuel oil and propane prices spiked sharply during the winter of 1996-1997, the state tripled the amount of savings it usually gets from this resource to $936,831. Nearly 6,000 households benefited from the program, which was almost half of the LIHEAP population. However, the 1997 savings were not repeated in subsequent years; dropping to less than $7,000 as of 2007. In 2010, the discounted fuel amounted to a savings of $383,319 for 5,616 LIHEAP households. In Iowa, where about 15 percent of low-income households use propane, the LIHEAP office in 1997 established a pre-paid program for propane or fuel oil delivery using $2.8 million in LIHEAP emergency contingency funds. The program has continued each year since, with savings varying each year depending on fuel prices. Vendors agree to contract with LIHEAP to deliver fuel from early October to mid-April, or until funds in the prepaid LIHEAP account are exhausted. Effective FY 2004, the state allows vendors three options: to deliver fuel at the prevailing price at time of delivery, to deliver at a fixed cost per gallon, or to deliver at a fixed cost with the vendor agreeing to charge the lower price should the cost of fuel at delivery time fall below the capped price. In 2002, the program saved the state LIHEAP about $700,000. However, since then the state has not seen propane prices drop much during the summer, so savings have been not been significant. The state office believes the program is important, regardless of savings, because it allows households to get a fuel delivery early in the heating season, which can reduce the need for crisis assistance among delivered fuel households. For FY 25015, the state had $3.5 million to lock-in summer prices. In June 2007, Connecticut passed legislation creating a Fuel Oil Conservation Board (FOCB), the first of its kind in the nation. The FOCB was tasked with developing and implementing cost-effective fuel oil energy conservation programs and market transformation initiatives for residential, including low-income, commercial and industrial fuel oil customers. The board was funded through a portion of the excess revenues generated by the state's gross receipts tax on gasoline. First year funding, from July 1, 2008 to June 30, 2009 was $10 million. Under a program beginning in December 2008, households eligible for Connecticut's LIHEAP could receive free of charge a new oil heating system if their system was found to be inoperable, unsafe and unrepairable; the FOCB would also fund weatherization for these households as needed. The program operated through community action agencies, which also administer LIHEAP and weatherization. In 2009, the FOCB funding was decreased to one-quarter of what was expected, about $2.5 million was used to provide 451 low-income customers with new or upgraded heating systems. The loss of funding resulted in closing down all subsequent programming. Vermont levies a one-half percent gross receipts tax on all non-transportation fuels as well as regulated electric and gas utilities, as a result of 1990 state legislation. The money supplements the Weatherization Assistance Program at about $4 million annually. The tax is scheduled to sunset after June 2016. In Virginia, all participating vendors who provide deliverable fuel to LIHEAP recipients sign an agreement stating that they will not charge the 4.5 percent Virginia sales tax to energy assistance customers. While this tax is waived, vendors may charge any local sales tax applicable. Fuel cooperatives pool the purchasing power of consumers in order to obtain lower prices for unregulated fuels, most commonly heating oil. Unlike a bulk purchase arrangement, the customer generally purchases directly from the vendor. Most of the existing fuel co-ops are in metropolitan areas of the northeastern states. The Mass Energy Consumer Alliance (formerly the Boston Oil Consumers Alliance) was created in 1982 to reduce the burden of high energy costs for low- and moderate-income residents of the Boston area. Its oil program serves over 13,000 households in eastern and central Massachusetts with prices generally 15 to 30 cents below retail. Members of the heating oil discount program saved 44 cents per gallon on average over the 2014/2015 season. The nonprofit Energy Cooperative of Pennsylvania has operated since 1979 offering lower prices to thousands of households in five counties. Members save an average of 21 cents per gallon compared to the state retail average. Savings amount to $100 or more during the heating season. For more information on any of the topics mentioned in this memorandum, please contact the Clearinghouse. Clearinghouse Memorandum # 820, Leveraging Nonfederal Resources for LIHEAP. Copies of vendor agreements from states that have negotiated bulk fuel discounts.